November 28th, 2018, Surrey, British Columbia. LinkGreen is pleased to announce that West Coast Floral Growers and Distributors, a leader in the floral industry has partnered with LinkGreen to deliver customers access to real-time inventory when ordering online. West Coast Floral Growers and Distributors has been in operation since 1989 and has become a premier supplier/distributor of cut floral and live potted plant materials in BC, Alberta, and Washington State. As a leader in the industry, West Coast Floral aimed to streamline their order management process while offering their customers convenient access to their most up-to-date inventory when ordering. In order to achieve this, LinkGreen created a direct integration between West Coast Floral’s internal inventory and order management systems, establishing a seamless online ordering and order management process. This integration ensures that each customer receives real-time inventory and their specific pricing, creating a personalized purchasing experience. Through the two-way integration, each order placed through LinkGreen's online and mobile ordering is delivered directly into West Coast Floral’s internal system which in turn eliminates any manual order entry. This allows West Coast Floral to fulfill orders with greater accuracy, delivering their customer's exceptional order fulfillment. LinkGreen delivers further efficiency by allowing retailers and florists to integrate their Point of Sale Systems into the same platform. 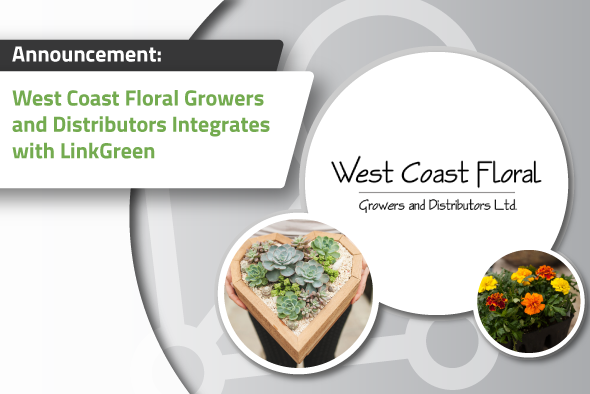 Via API or similar data exchange mechanisms, LinkGreen can connect any approved purchaser to West Coast Floral’s inventory information. This integration can further streamline the supply chain, offering truly friction-less transactions. LinkGreen continues to work with leaders in the Fresh Floral and Greenhouse industry to streamline the way businesses transact, creating a more efficient and connected supply chain so everyone can realize the benefits that technology has to offer. LinkGreen (www.linkgreen.ca) is a technology solution that connects industry supply chains to make wholesale buying and selling fast and easy.The company has created a fully connected and integrated supply chain that provides innovative operational efficiencies, modern sales, and marketing opportunities, and a familiar digital ordering experience for suppliers, distributors, and retailers.Now in its fourth year of operation, LinkGreen serves multiple industries, including Lumber & Building Materials, Greenhouse, Nursery & Floriculture, Lawn & Garden, Cannabis, and Home Decor. With over $765 million in vendor supply available, there are more than 4,200 registered wholesale buyers who now enjoy an electronic supply chain.